The relentless Hong Kong sun beats down on your neck while you hunt for shade at the exposed pier. The affluent Discovery Bay on Lantau Island has two ferry piers; the one you need is much barer than its modern counterpart, used only for the big boats. You need to take a far more local ferry to get to the small island of Peng Chau that lies a very short distance away from where you now stand. In the distance, you see a smoking tug boat style ferry chugging towards you. As the tyre that acts as a bumper on the prow of the vessel connects with the concrete of the dock, people immediately begin to jump off. Elderly ladies with bow legs carrying many times their body weight in market goods speed ahead of you to get shaded spots aboard the nautical jalopy. Finding a shady seat on board, you ready yourself for departure. As soon as the ferry is on its way, your fare is collected and, before you know it, you are starting to dock at your destination. Disembarking on the tiny island, you take note of the hideous concrete towers so imprudently constructed in the 1970s. If it were not for your knowledge of the treasures that lie hidden amid the chaos, you would have got straight back on the boat. 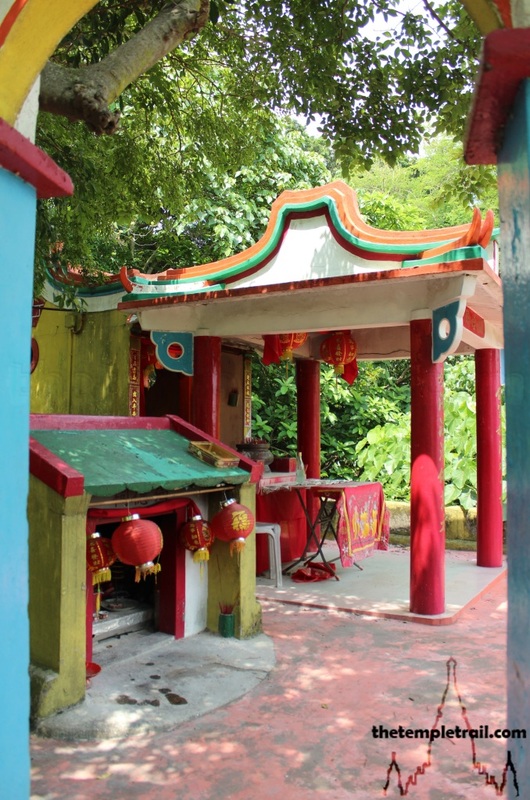 Course clear in your mind, you set out to discover the small temples of Peng Chau, an island of goddesses. As you cross the isthmus of the island, you pass some older houses. The narrow lanes quickly give way to a more open space and in a matter of minutes you are on the other side of the island. The smell of joss smoke hooks your nostrils and following the scent trail, you see the first temple of your visit before you. 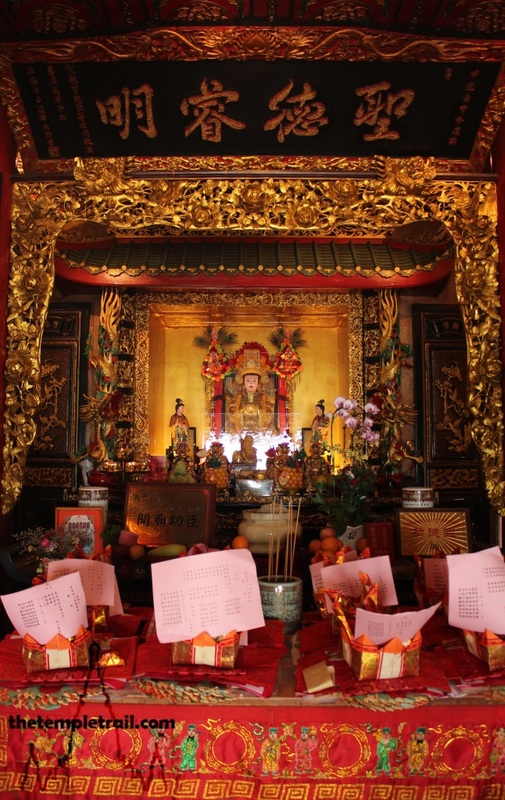 Lung Mo Temple is the largest on Peng Chau and the activity going on ahead of you suggests that it is also the busiest. Lung Mo (龍母 Lóng Mǔ) is the Dragon Mother, a goddess of parents and children. Born in Guangxi in 290 BCE, Lung Mo was called Wēn Shì (溫氏). When washing clothes on the river bank one day, she found a smooth, white, shimmering stone which she took home. The stone actually turned out to be an egg and seven months and 27 days later, five baby snakes hatched from it. She cared for the snakes as a mother, but one day the talented swimmers disappeared into the river. The snakes reappeared to their ‘mother’ as five-coloured and striped dragons five years later. When there was a draught in her village, Wēn Shì asked her dragons to make it rain. As water spirits, the dragons had control over the weather and when the rains came, the villagers began calling her Lung Mo. Word spread of her powers and eventually Emperor Qin Shihuang (秦始皇 Qín Shǐhuáng), first emperor of China and the Qin Dynasty (221 – 206 BCE) summoned Lung Mo to the capital of Xianyang (Xi’an). The now elderly lady was frail and her dragons worried that she would not survive the journey. When Lung Mo was aboard the boat sent by the Emperor to collect her, the five dragons under the water and followed the boat to Guilin for ten days. In the middle of the dragons towed the ship back to the starting point. This happened over and over again, until the Emperor repealed his order for her to come to him. Lung Mo was allowed to remain and she died of old age in her hometown. The dragons took human form upon her death and became the Five Scholars (五秀才 Wǔ Xiù Cai). 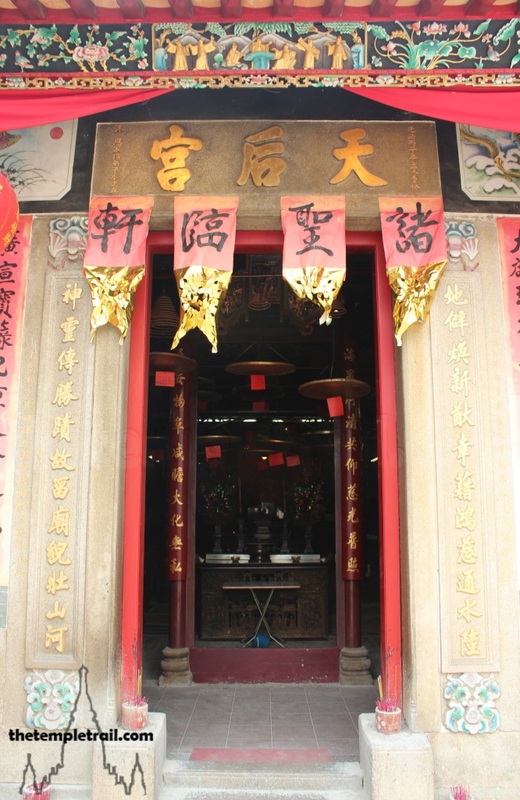 Standing at the front of the temple that is also known as Yuet Lung Sing Yuen, you see that it is not ancient. It was built in the 1970s, but has fast become an important centre of worship on the island. As Lung Mo is a water deity, she was primarily worshipped by the Tanka boat people of Hong Kong, until the islanders began also to pay homage to her. Her devotees do not eat carp as she is said to be incarnated in the fish. 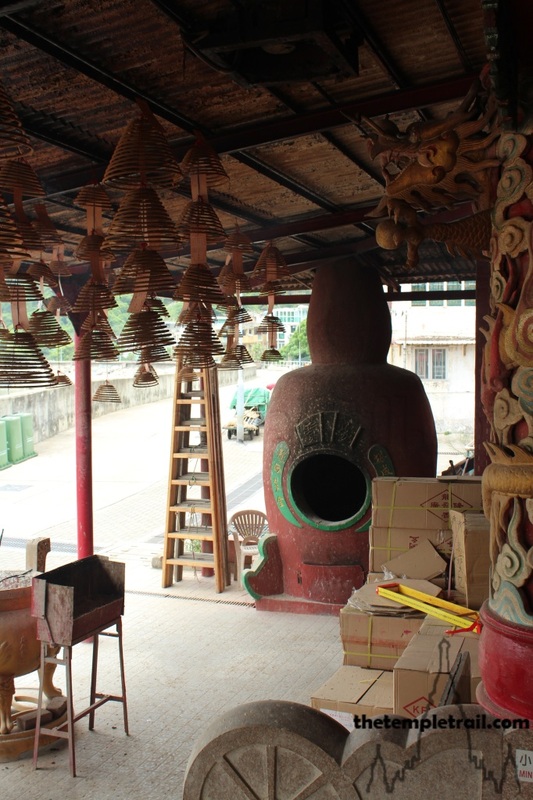 The temple is the largest on Peng Chau and as you approach it, your eyes feel the sting of the incense smoke. The concrete building is clad in deep red tiles and looks a little like a converted house. 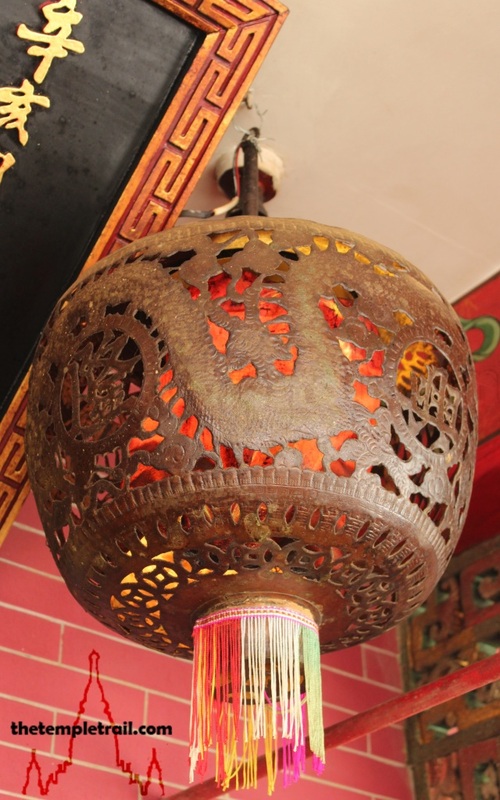 Walking under the incense coils, you pass the gourd-shaped incinerator and enter the temple’s central chamber. Before you lies the main altar with the Dragon Mother herself. This central altar is called the Dragon Bed and to touch it is to gain immense luck, see into the future and have big, strong babies. Looking into the eyes of the goddess, you feel the parental kindness radiating from the statue. The lit towers of votive tokens either side of the altar give a moody lighting to the small statues of the goddess atop each of them and the sensation of being looked over by benevolent mother like figures sets the tone for the central chamber. You make for the right hand room and find yourself in the presence of Kwun Yum (觀音 Guānyīn), the goddess of mercy. In her green bamboo tiled setting, her white statue stands out. Her serene face is at peace and she holds a flower in her hand. 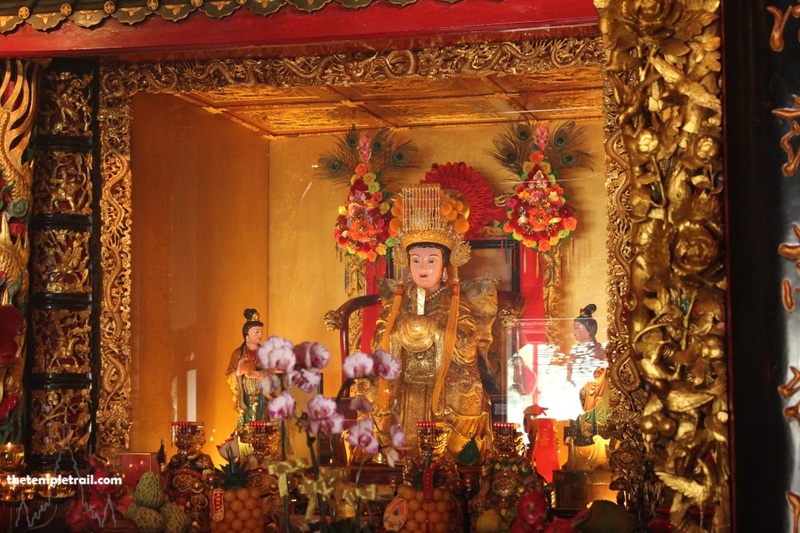 In front of her is an array of others including Wai Tor (韋馱 Wéituó), a protective bodhisattva and Na Cha (哪吒 Nézhā), the child god of war and protective deity. Crossing back through the main hall, you walk into the room on the left. 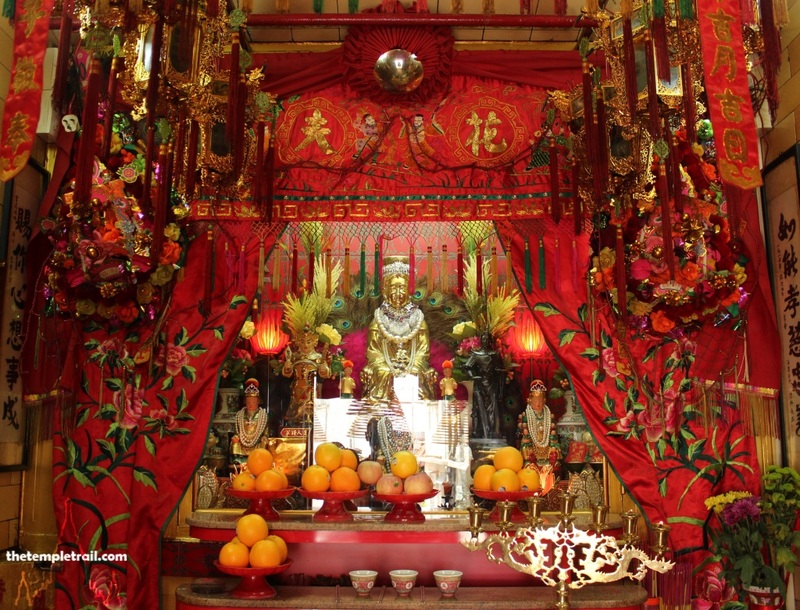 The main god of the chamber is Kwan Tai (關帝 Guān Dì), the red-faced god of war. He was a general of the Three Kingdoms Period and is popular throughout the Chinese influenced parts of the world. He is one of the most important deities in the Chinese folk pantheon and can be found in almost every Chinese business and home. He is a protector god and symbol of loyalty. Kwan Tai shares his red chamber here with Lo Ji (老子 Lǎozǐ), the semi-mythological founder of Taoism and the Tai Sui (太歲 Tàisuì), year gods. These sixty heavenly generals must be appeased so that they do not bring misfortune upon you. After a while longer with the gods of the left chamber, you exit and make your way out of the smoky temple precinct. Coming back the way you came, you re-enter the village and pass through some narrow streets, shortly ending up in a small square. The rare open space in the village sits directly in front of the Tin Hau Temple. Tin Hau (天后 Tiān Hòu) is a sea goddess who is worshipped all over the south of China. She was a historical figure from Fujian province who came to be worshipped after her death a thousand years ago. The Empress of Heaven looks after the boat people and sea travellers. 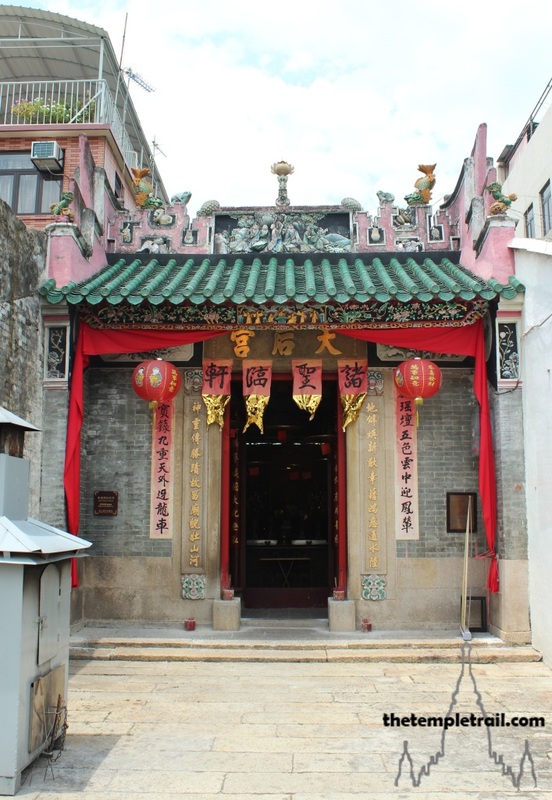 This temple is not that old, but is one of the oldest on Peng Chau, dating from 1792. Entering the dark temple interior, you find you are surrounded by figures and objects. Passing the two door gods, you stand before the open spirit screen doors. To you left is a ritual sedan chair for the goddess and a bell cast in 1752, making it older than the temple itself. To your right is a small shrine to Fuk Tak Kung (福德公 Fú Dé Gōng), a manifestation of the Earth God To Dei Kung (土地公 Tǔ Dì Gōng). Walking past the sedan and the offering table in the centre of the temple, you pass a model of a junk boat and climb a couple of steps to the rear of the temple. Here, standing in front of another offering table you once more take in your surroundings. To your right is a glass painting of the All Saints. The old-style painting depicts seven gods, Kwun Yum, Pau Kung (包公 Bāo Gōng) – the God of Justice, Pak Tai (北帝 Běidì) – the Northern Emperor, Wai Tor, Kam Fa (金花 Jīn Huā) – the Golden Flower goddess and Tai Sui. Ahead of you is the main altar. Occupying centre stage is Tin Hau and below her is To Dei Ju (地主 Dì Zhǔ), another avatar of the Earth God. Next to the Earth God is a plaque for Baak Fu (白虎 Bái Hǔ), the White Tiger, a demon subduing deity. In the altar on the left is Choi Pak Sing Kwan (財帛星君 Cái Bó Xīng Jūn), a god of wealth. Originally a magistrate from Shandong Province called Lǐ Guǐ Zǔ (李诡祖) during the Northern Wei period (386 – 535 CE), he was deified by the first emperor of the Tang dynasty (618 – 907 CE). The altar on the right houses Hung Shing Yeh (洪聖爺 Hóng Shèng Yé), a sea deity. Hung Shing was a Tang dynasty official in Guangdong Privince named Hung Hei (洪熙 Hóng Xī). He was deified immediately following his death as ‘Saint King Hung, Widely Beneficial of the South Sea’. By the altars you see a whale bone that was brought by fishermen hundreds of years ago and is said to give blessings to the local community. Next to the whale bone is Shun Fung Yi (順風耳 Shùnfēng Ěr) – Favourable Wind Ears, and opposite him, Chin Lei Ngan (千裡眼 Qiānlǐ Yǎn) – Thousand Li Eyes. These two demonic figures are attendants to Tin Hau, but these two depictions are unusual in that their skin colour is normal human tone. The immortal brothers were unpleasant beings according to one story. Chin Lei Ngan, often depicted as red, is described as having a blue face, flaming eyes and prominent teeth like those of a rhinoceros. Shun Fung Yi is green faced with two horns and teeth like swords. They were servants of the wicked tyrant King Zhou (商紂王 Shāng Zhòu Wáng) of the Shang Dynasty (1600 – 1046 BCE), who died in his palace as it burned to the ground. The two brothers were killed by an immortal who split their skulls with his magic whip. The two were redeemed and reappear as the subdued servants of Tin Hau, making up for their sins with good deeds. Leaving the dark recesses of the Tin Hau Temple, you take a few steps through the square and turn right into a small alley. At the end of the passage, you see a glittering object inside a small shrine. Enticed by the gold, you are pulled toward the holy spot. A tiny square is occupied by the Kam Fa Shrine. Kam Fa Leung Leung (金花娘娘 Jīn Huā Niáng Niang), the Golden Flower Goddess, is the patron of pregnant women. Kam Fa was a Robin Hood type of character in Chinese folklore and robbed from the rich to give to the poor. Her story says that she was the daughter of a martial arts master and that she was naturally gifted with a good character and strong aptitude for the fighting arts. The intelligent young girl lived in a time of government corruption and many people were poor and exploited by local officials. Kam Fa began to try to set things right by robbing rich people and giving the money to poor people. She became hugely popular with the locals, but hunted by the government. Kam Fa went into hiding and escaped to a mountain cave. Her father sought to find her and, along with other allies, went to the cave, only to discover that she had vanished. In her place was human fossil that became an object of worship. She was given the title of Goddess Saviour of the World. 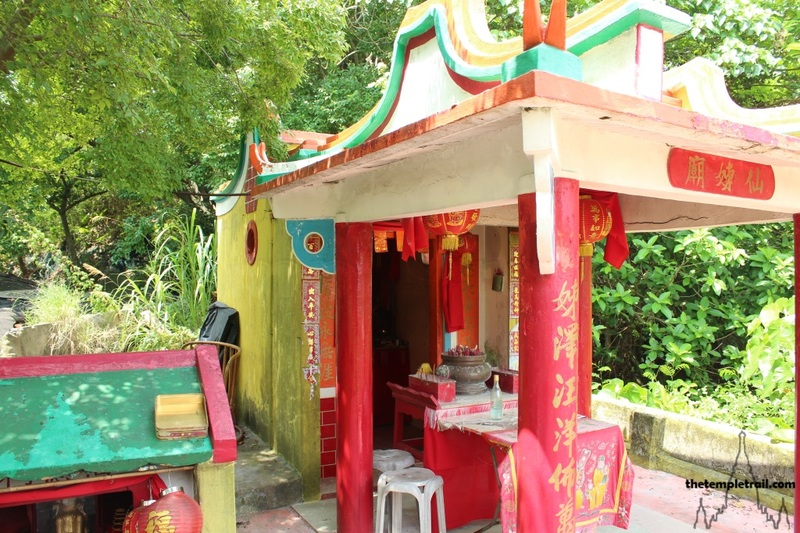 The story of the Peng Chau Golden Flower Shrine also has an element of magic about it. In the early 16th century, a local fisherman found a piece of human-shaped driftwood at sea with the characters of Kam Fa inscribed on it. He secured this wood to the prow of his boat like a figurehead, resulting in huge catches. His success was emulated by other local fishermen when they wrote the name of the goddess on red paper and stuck it on their boats. The locals eventually built a small shrine to Kam Fa in appreciation of her benefaction. In 1762, during the Qing Dynasty (1644 – 1911 CE), Lai Guo Wen, a herbalist, was trying to find a cure for his wife’s illness. 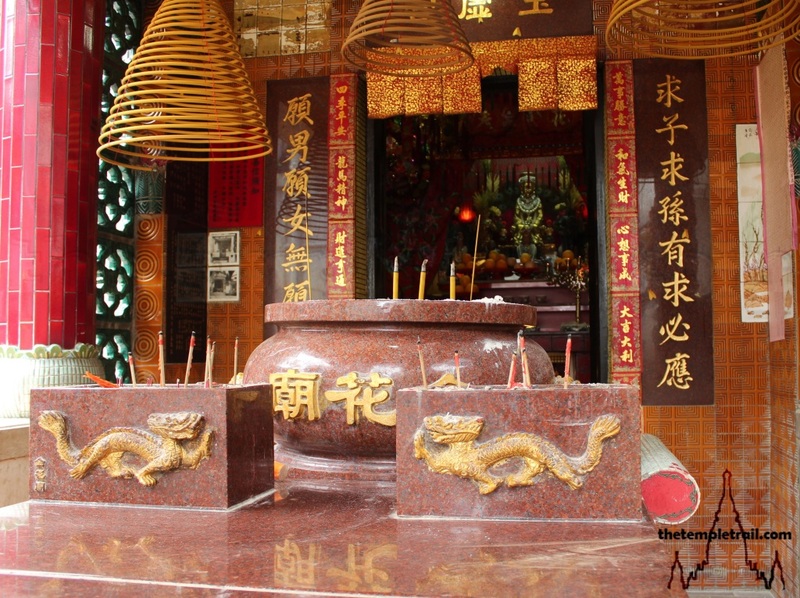 His search brought him to Peng Chau, where he encountered the shrine. He prayed to find a cure and when he returned home, his wife was better. 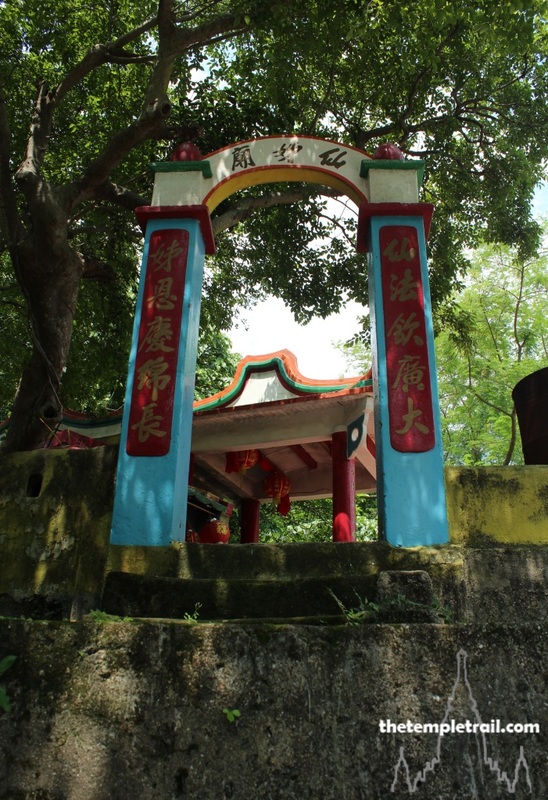 He returned to Peng Chau and built a permanent shrine to Kam Fa. The current temple was renovated in 1978 and that is what you see before you today. 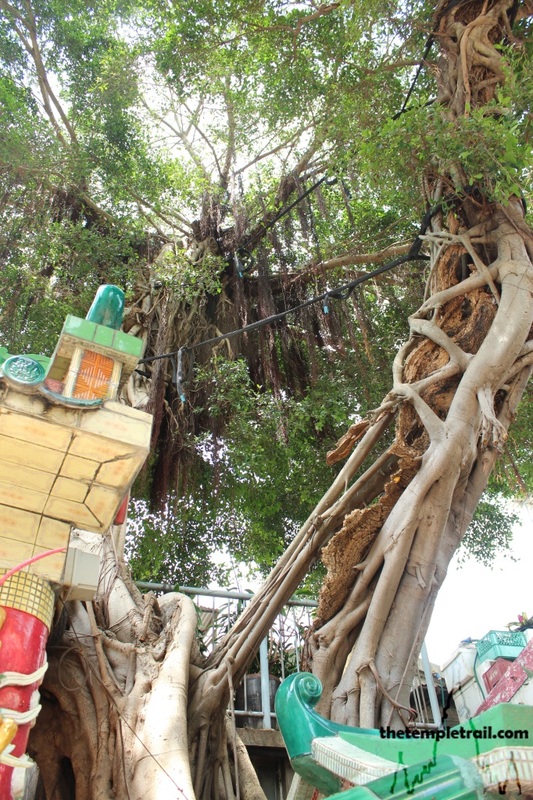 As you approach the small, well-tended shrine, you note the large banyan tree that grows next to it and the smaller shrine in front of the tree. 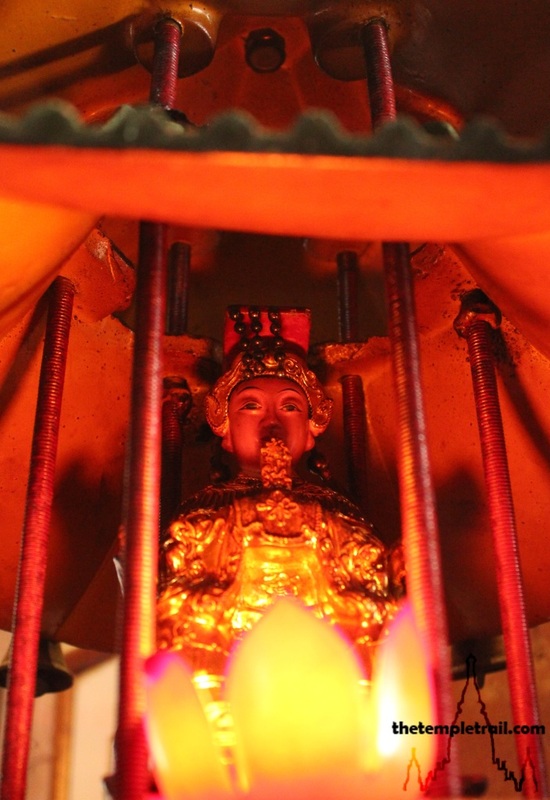 Peering into the small shrine, you see Kwan Tai is the central figure and below him is To Dei Kung. This little house is tiny in comparison to the ancient gnarled banyan. The tree has a small plaque next to it for the tree protector god. In many Asian cultures, trees, particularly banyans, are said to contain spirits and gods. This one is clearly very special, likely due to its place next to Kam Fa’s shrine. Yu thread through the dragon columns and into a smoke filled space. Entering the small shrine, you are fascinated by the shimmering golden statue. It is unusual to see such a depiction in gold. 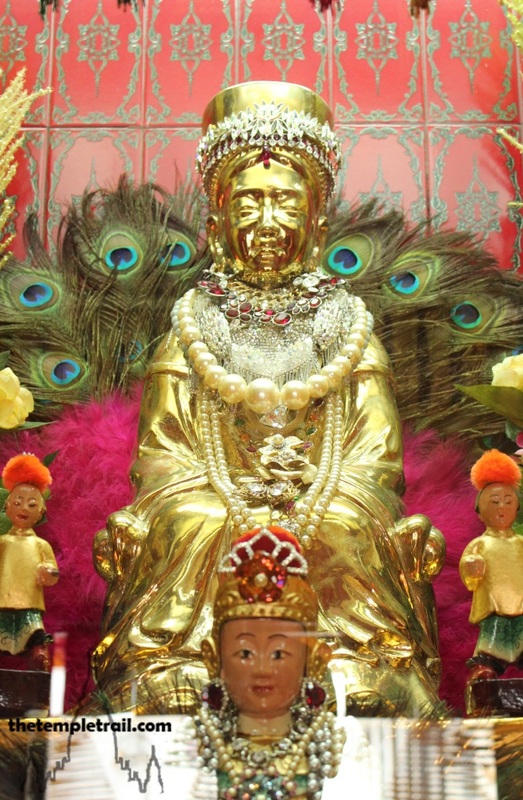 The golden idol is adorned with pearls and other necklaces given by devotees. The statue to her left is of her most famous devotee. Now called the Guardian General, it is of Master Kwan Tak-hing, a businessman who developed a special connection with the goddess. The story goes that in 1981, Master Kwan had a dream of the goddess while away on business. In it, Kam Fa told him to come to her shrine and pay respect to her. Kwan had never heard of the place before the dream and duly came to visit. At the same time, Kam Fa appeared in a dream to Madam Kam Lan, the head of the shrine, telling her to receive a visitor. After more visions, Master Kwan became a very special disciple of the goddess and brought many people to worship at the shrine and it received the necessary funds to be refurbished and to prosper. When Kwan died in 1996, Kam Fa told Madam Kam Lan that Master Kwan was originally a celestial fairy and that he had now regained his throne as the Guardian General. The statue of him was made and installed by his son in order to protect and aid Kam Fa. After a few moments with the old and new heavenly beings, you leave the shrine and look down the old well to the left of the building. The well is ancient and cared for by the Well Protector God, whose tablet is located nearby. Looking down into the well, you see a turtle swimming in the bottom. You wonder whether it knows that it has divine protection in its cool home. Taking another narrow street, you make your way back to the front of the island, where you first arrived by boat. 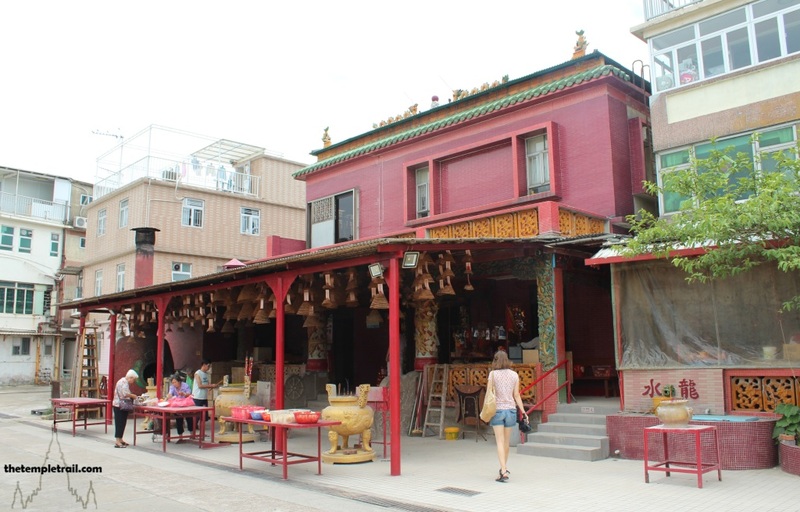 You walk along the seafront in search of the final temple of Peng Chau. Passing boarded off building sites, you search for a while, before you find the correct path that takes you to the small and haphazard Seven Sisters Temple. Locally called Chek Tset Miu, the Seven Sisters Temple, is not spectacular in any sense of the word, but it enshrines an interesting group of local spirits. The story of the Seven Sisters, Tsat Tsz Mui (七姊妹 Qī Zǐ Mèi), tells of a group of Hakka girls who become sworn sisters and agree never to marry. This is said to have taken place in Hong Kong and there is an area in North Point, formerly a village, named after them. These seven young girls swore an oath to die rather than marry. One day, the parents of the third sister, arranged for her to marry, much to the dismay of the sisters. On the night before the wedding, the sisters decided to make good on their oath and they committed group suicide on the beach. Seven rocks appeared in the bay the next day and were named the Seven Sister Rocks. The village too was renamed Seven Sisters Village. 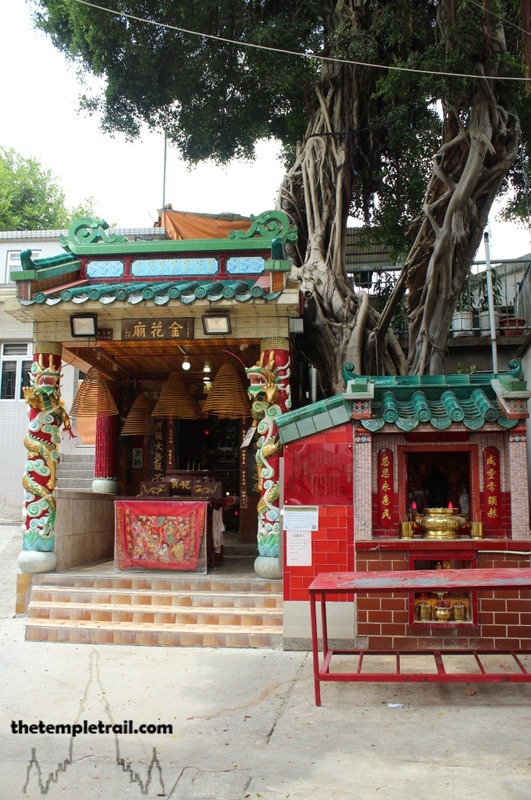 While the rocks are no longer visible, due to land reclamation, the area still bears the name and this small temple, somewhat removed from the location of the act on Hong Kong Island, reminds all of their determination and sisterhood. This rather lonely section of the island seems somewhat abandoned by humans, but is home to a more celestial group of inhabitants. 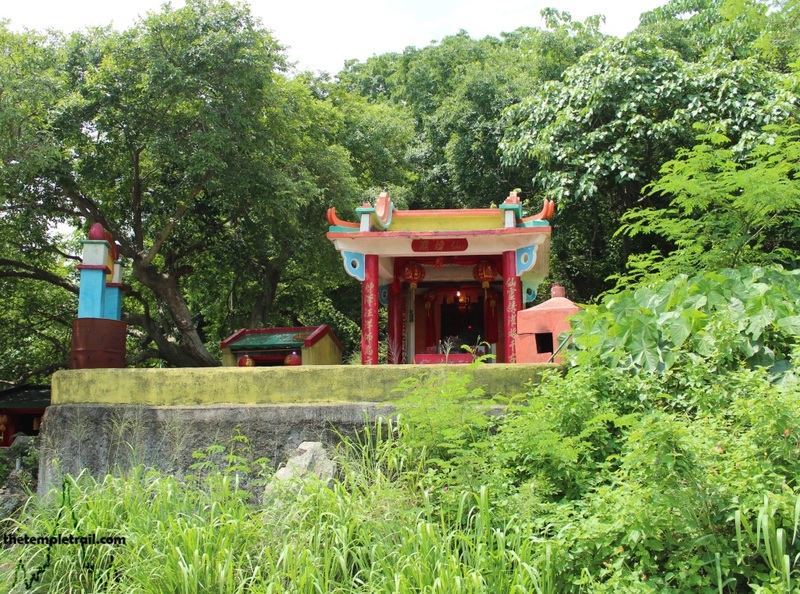 At the base of the small hillock that Chek Tset Miu rests atop are two brightly painted, but ramshackle shrines. You pass the first, a shrine to a local tutelary deity, and the second, to Na Cha. At the top of a short set of stairs, a bright blue and white archway bears the name Sin Tsz Miu (仙姊廟 Xiān Zǐ Mìao), meaning Immortal Sisters Temple. A small shrine to To Dei Kung watches over the entrance to protect the area from evil spirits that would disrupt the harmony of the temple. The main temple, built in 1954, is little more than a shrine. It is small, but unusually shaped and painted in vivid red, yellow, green and blue. Inside, the temple is much darker and quite bare. The simple altar has statues of two of the sisters and a painting of all seven behind them. Locals say that one of the statues was found by the first temple keeper when he was at sea fishing. Traditionally, young girls prayed to the goddesses to improve their needlework. Rather ironically, the Sisters also help couples who want to have children. Meandering back to the boat, you take stock of your surroundings. This tiny island is rich in spiritual wealth. The divine feminine rules it and you are enswathed in motherly love. The benevolent forces that watch over the island have been here for centuries. The island is more theirs than any human’s. As one more passing traveller, you feel blessed to have spent a short while with them and shared in their history. Boarding the rickety ferry, you hope that the holy ladies of Peng Chau will protect your short ride over the waters.